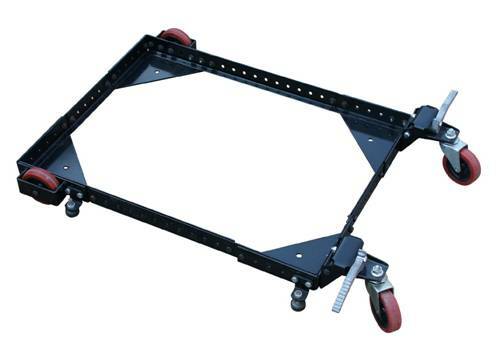 Two main universal mobile bases , 400lb & 500lbs , are easy to assemble 12 inches of rails & 18 inches of side rails and installed with 4 robust wheels and each corner of base is with adjustable rubber leveling feet. This base is an ideal moving fixture for any woodworking machines to move around with ease to save space in your own working space. 3.MAX SIZE:27-3/4" X 32-1/2" OR 25" X 35-1/4"
3) heavy-gauge steel, with 4 wheels.